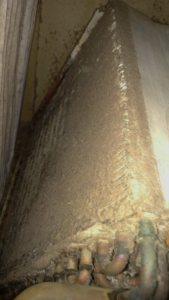 The following article on “HVAC Compressor Damage: Lightning or Wear & Tear”, written by Matt Livingston of HVAC Investigators, originally appeared in the Technical Notebook Column of the July 2017 issue of Claims Magazine and was also featured on Property Casualty 360. Regardless of application (refrigeration or HVAC) or building type (residential or commercial), the primary purpose of a compressor is to draw low-pressure refrigerant vapor from the evaporator, compress that vapor, and prepare the refrigerant for heat removal in the condenser. Residential compressors typically operate on single phase alternating current (AC), and thus require a capacitor to assist in both starting and running the compressor while energized. Another reason for mechanical failure is improperly sized equipment or failure to follow system repair best practices. An oversized metering device (commonly called a Thermostatic Expansion Device or TXV) at the evaporator coil may allow more refrigerant to enter the evaporator than can be vaporized, causing a floodback of refrigerant to the compressor, wearing out the compressor’s bearing surfaces and accelerating its failure. 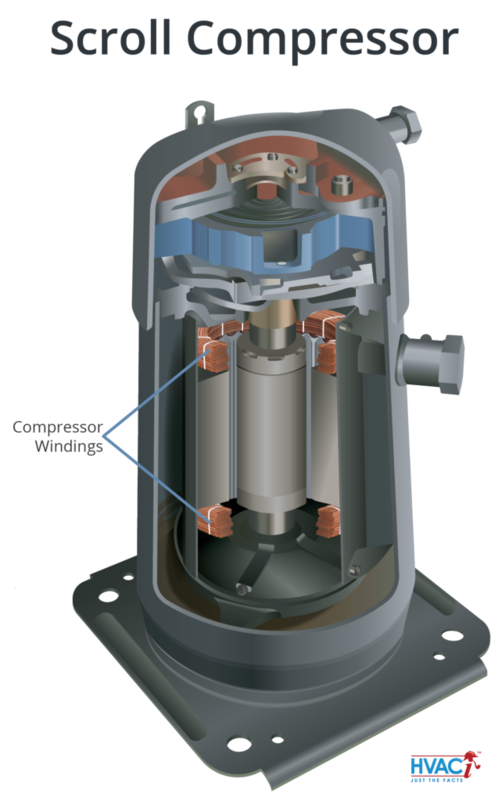 Like traditional single-phase motors, single-phase compressors contain both “start” and “run” windings, which are a series of copper wires wound around the stator, and which cause the motor to turn when energized by electricity. As the names imply, the start winding is engaged to start the compressor, while the run winding is in use for the duration of compressor operation. The continuity of these windings is critical to compressor operation, and can be tested using an ohmmeter to determine the health of each. Common winding damage includes “open windings” or “shorted windings.” Open windings indicate that there is a break in the windings, while shorted windings indicate that the two windings are either making contact with one another or with the shell of the compressor itself. Either type of winding damage can be caused by a voltage imbalance or by mechanical failure…neither of these circumstances alone indicates lightning or wear and tear. 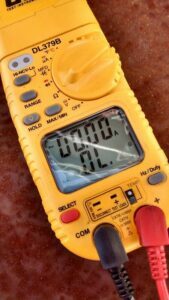 If a singularity of overvoltage occurs from a lightning or power surge event and causes a break in one or both windings, typically other components (such as the fan motor or capacitor) are also damaged. 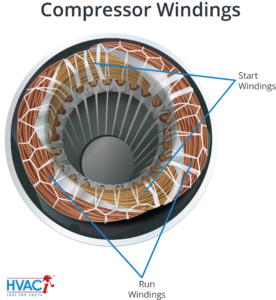 If open windings are found and the compressor is the only electrical component damaged, this is likely the result of a mechanical failure that caused the compressor to overheat. Although technically an electrical failure, the genesis of shorted windings can often be traced back to mechanical issues with the compressor. The insulation of the windings can become compromised by excess heat, vibration, or contaminants and cause the windings to make contact with one another (shorted) or with the compressor shell (shorted to ground). Compressor windings can also become shorted by lightning. This is more commonly observed in older compressors, where even small increases in voltage can cause significant damage to winding insulation and lead to shorts. Again, in these cases, the compressor will likely not be the only component damaged since the event will have also affected other electrical components. There is no single defining “symptom” that can indicate with absolute certainty whether an HVAC compressor was damaged by lightning, a high-voltage surge, or simply by age-related wear and tear. Only by gathering all the evidence (visual, measured and corroborative), can we accurately determine what caused the loss and the best course of action that should be pursued to return the system to pre-loss condition.